You will be amazed at the plethora of things to do in Riviera Maya. 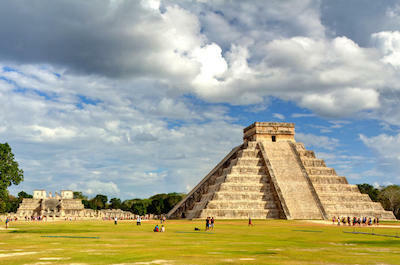 You will be intrigued at the engineering marvels of the Mayan ruins at Chichen Itza, Coba and the walled city of Tulum. Other fabulous trips include a cultural experience at Xcaret, ziplining at Xplor and an ATV ride through the jungle as well as the white sand beaches. If you like watersports then snorkeling in the crystal blue water in one of the many cenotes is a plus and if you like scuba diving then you can explore one of the many underground river systems. Whether you are seeking a cultural experience or an adrenaline rush, you are sure to find plenty of Riviera Maya activities that work for the whole family. 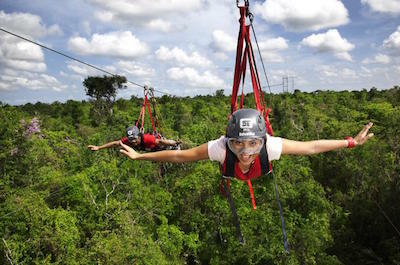 If you are looking for a unique eco-park that gives you the thrills of adrenaline and a great perspective of the environment, then the best thing to do in Riviera Maya is for you to take the family to Xplor Adventure Park. You will be amazed at the fun that awaits you at Xplor Adventure Park because nature provides the backbone of the fun at this eco-adventure park. You can swim or raft around an underground cave river with natural stalactites and stalagmites all around as you pass through rapids. Other stellar attractions include riding in an off-road amphibious vehicle that allows you to explore the jungle and underground river. A glide on the ziplines takes you high above the jungle canopy and gives you breathtaking views of the Caribbean Sea. An added bonus about Xplor Adventure Park is that the fun does not stop when the sun goes down and visiting in the evening brings a whole new dramatic background to your adventure. 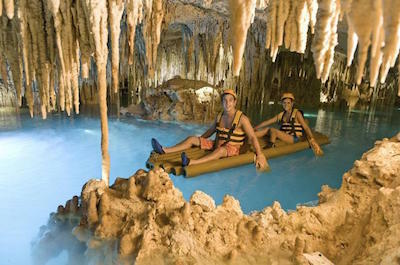 You can also combine this exciting thing to do in Riviera Maya with Xel-Ha, Xcaret or a trip to the ruins in Tulum. Organized tours to are available from hotels in Playa del Carmen in Riviera Maya and Cancun. If you like to explore history and learn about the culture of ancient people, then Chichen Itza is a great thing to do in Riviera Maya for you and your family. 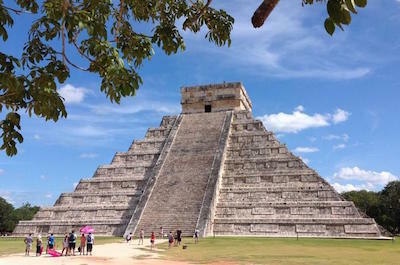 Chichen Itza is one of the worldÕs most renowned archaeological sites and is recognized as an UNESCO World Heritage Site. One of the best ways to view the incredible rehabilitated structures is an all-day tour where you have an expert guide explain all the fascinating details of the Mayan culture as you walk in awe of the engineering feats. You be enthralled learning about the ball court, the Observatory and the Colorado House as well as the Sacred Cenote where human sacrifices took place. You can combine Chichen Itza with a side stop at the city of Valladolid, the ruins at Coba or Ek Balam and you can even take a swim in the cenote Ik-Kil, which is an exciting thing to do in Riviera Maya. Organized tours to are available from hotels in Playa Del Carmen Tulum, Tulum-Akumal in Riviera Maya and Cancun. When you are seeking to view and learn interesting facts about the ancient Mayan royalty, then one of the best things to do in Riviera Maya is to visit the Tulum Ruins. 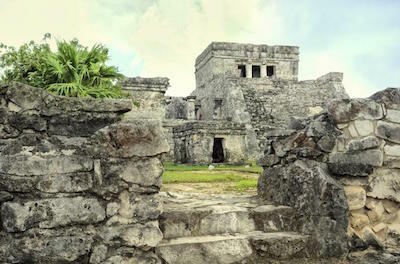 The Tulum ruins are truly a spectacular story that has been preserved to a pristine condition which even includes original paint colors and exquisite architecture. Known as the Walled City that was once occupied only by high priests and the Mayan royalties, the Tulum ruins are situated high on a cliff's edge overlooking the beautiful blue waters of the Caribbean Sea. 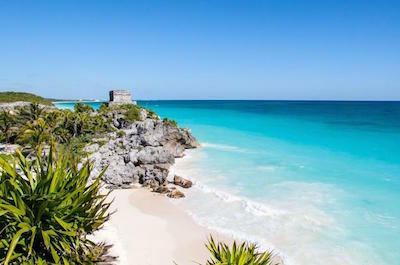 Another great item about going to the Tulum ruins is to spend some time in Mayan Beach where the warm water has hues of turquoise and the soft white sand is one-of-a-kind. There are a wide variety of tours which even include side trips to such places as Xel-Ha, Xcaret or swimming with turtles at Akumal. Organized tours to are available from hotels in Playa del Carmen and Tulum in Riviera Maya, and Cancun. If you want to swim in one of the most beautiful cenotes in the Yucatan Peninsula, then the ideal thing to do in Riviera Maya is to visit Cenote Ik Kil. Located just outside the town of Piste near the famous Chichen Itza Mayan ruins, Cenote Ik Kil is an oasis within an oasis. Once at the Cenote Ik Kil you will be in awe of the natural jungle landscape that surrounds this special place. Cenote Ik Kil has crystal clear water which has earned this cenote the nickname of Sacred Blue Cenote and is accessed by climbing down a wooden staircase. The landscape is idyllic with vines hanging down some 85-feet before touching the water and there are fabulous waterfalls flowing into the cenote. 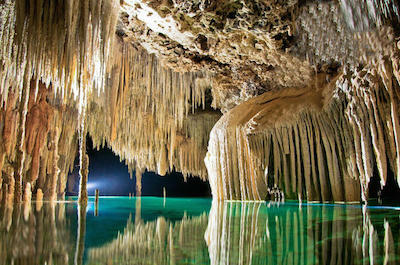 Once in Cenote Ik Kil you can swim and snorkel in the 130-feet deep water. Another bonus about Cenote Ik Kil is that you can combine this with a stop at the ruins of Chichen Itza or Coba as well as a tour of the city of Valladolid. If you are looking for an exciting adventure swimming in cenotes, biking through the jungle, learning about the Mayan culture, then the best thing to do in Riviera Maya for your family is to visit Xel-Ha. Located 8-miles north of Tulum and 6-miles south of Cancun, Xel-Ha combines several experiences that are unique to the Riviera Maya area within this 22-acre nature area. You can indulge in cliff jumping, snorkeling in a cenote, kayaking in the lagoon or cross the rope-style platform Trepachanga. You will view Mayan archaeological ruins or you can fly through the air on a zipline and you can even swim with dolphins. 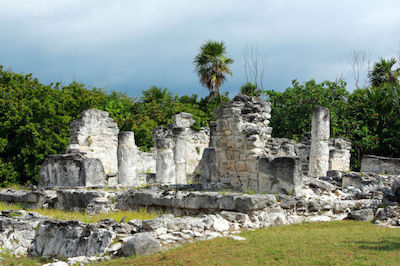 There are several exciting tours that include stops at the Mayan ruins in Tulum or the lesson viewed ruins at Coba. Whether you are staying in Playa del Carmen or on Cozumel or Cancun is there the perfect trip to Xel-Ha available for you. Organized tours to are available from hotels in Playa del Carmen, Tulum and other Riviera Maya hotels. If you want to explore an underwater cave but are not the strongest swimmer or snorkeler, then the best thing to do in Riviera Maya is to adventure through the Rio Secreto Nature Reserve. Located just 10-minutes south of Playa del Carmen, the Rio Secreto Nature Reserve is perfect for all age groups including families. This incredible underwater cave system is about .5-mile in length with spectacular crystallized stalagmites and stalactites. You will be amazed that you can either hike through the water or swim a short distance to high ground. The Rio Secreto Nature Reserve is ideal to combine with other activities in the area like a journey on an ATV through the jungle, the Mayan ruins at Tulum or a jungle mountain bike ride. No matter which tour you decide to take the Rio Secreto Nature Reserve will leave you with lasting memories. Organized tours to are available from hotels in Playa del Carmen in Riviera Maya, and Cancun. If you are searching for an entertaining time for your family that includes an unlimited amount of natural fun, then the best thing to do in Riviera Maya is to take a trip to Xcaret Eco Park. 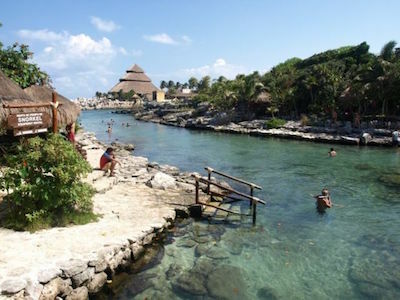 Situated just south of Playa del Carmen, Xcaret Eco Park is one of the most popular attractions in the Riviera Maya. You and your family will be thoroughly pleased with the numerous activities that can be found at Xcaret Eco Park that range from snorkeling to scuba diving on the reefs to tubing down an underground river to swimming with dolphins. Added entertainment at Xcaret Eco Park includes a comprehensive look into the culture and traditions of the Mayan people that once dominated the Yucatan Peninsula. You can combine a trip to Xcaret Eco Park with an early access pass to the Mayan ruins at Tulum or a trip to Xel-ha or Xplor. Whether you want to spend the day enjoying excellent watersport activities or a day learning about the Mayan people, visiting Xcaret Eco Park is ideal thing do do in Riviera Maya for you and your family. If you are searching for an adrenaline filled day that includes both aerial, sea and land adventures, then the ideal thing to do in Riviera Maya is to book a trip to Selvatica Eco Park. Located an hour south of Cancun and just minutes from Playa del Carmen, Selvatica Eco Park lets you explore the wonders of the Yucatan Peninsula in a variety of ways from ziplining to swimming in cenotes to racing through the jungle on an ATV to jumping into the jungle with a bungee cord that saves you at the last minute. Selvatica Eco Park has a variety of packages for everyone that is sure to please and you can mix as well as match your favorite activities with several to make for a perfect day of adrenaline filled adventure. When you want to explore the biggest archaeological find on the Yucatan Peninsula and climb the highest pyramid, then the best thing to do in Riviera Maya is to take a visit to the Coba Ruins. Located south of Playa del Carmen and west of Tulum, the Coba Ruins is a spectacular representation of Mayan engineering from centuries ago that range from astronomical observatories to elevated roads called sacbes to steles that portray the laws to the public to an incredible ball court where the winners lost their lives in glory. 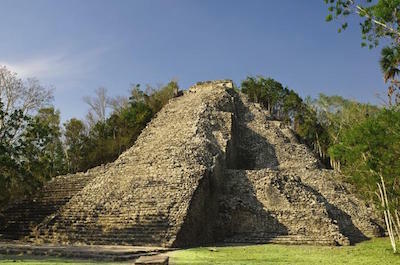 Another added bonus to visiting Coba is you can climb the highest pyramid on the Yucatan Peninsula and peer out over the lush jungle landscape. Other options to include with the Coba Ruins are swimming in nearby cenotes or a stop at the Mayan ruins in Tulum or Chichen Itza. 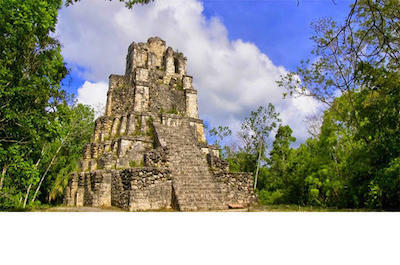 The Coba Ruins are an ideal place to take the family and the add-on options are a great way to enjoy a full-day of fun. When you want to view some of the best Spanish Colonial architecture on the Yucatan Peninsula, then the best thing to do in Riviera Maya is for you to plan a visit to the city of Valladolid. Located west of Cancun and Playa del Carmen on your way to Chichen Itza, the city of Valladolid is an idyllic look into the past of Spanish conquest and Mayan culture. You will be thrilled as you walk the streets viewing incredible buildings like the Cathedral of San Gervasio, the San Bernardino de Siena Convent as well as the San Roque Museum. Another added bonus to booking a trip to Valladolid is the ability to combine this with stops at Chichen Itza, Rio Lagartos Nature Reserve as well as with swimming in the nearby cenotes of Ik Kil and Zaci. Whether you are looking to explore the influence of the Spanish on history and culture or simply walk the streets eating delicacies like Cochinita Pibil or Lomitos, a trip to Valladolid is perfect for the family. If you are seeking adventure that includes several adrenaline filled activities as well as watersports, then the best thing to do in Rivera Maya is to visit Nohoch Nah Chich or the Giant Birdcage. NOhoch Nah Chich is one of the longest underwater cave systems in the world and features beautiful geologic formations like huge stalactites. You will be thoroughly pleased with the wide variety of excursions that are offered to Nohoch Nah Chich which range from scuba diving to snorkeling to exploring an authentic Mayan village. Other exciting options you can include with a day trip to Nohoch Nah Chich is an exciting 4x4 jungle ride, an adrenaline filled zipline ride that ends in a cenote and an incredible rappelling trip down steep cliffs. No matter what kind of adventure your family or you are seeking the Nohoch Nah Chich is the ideal playground for explorers. If you don't want to venture far from Cancun and still want to see some beautiful Mayan ruins, then the best thing to do in Riviera Maya is to walk through the El Rey Ruins. The convenient location of the El Rey Ruins within the Cancun Hotel Zone is ideal for anyone and all families that are interested in learning more about the engineering feats of the Mayans as well as the intricate culture that the Mayans shared with nature. There are a variety of options to include with a tour of the El Rey Ruins which include a walk through the Museo Maya and a stunning self-driving Hummer excursion through the surrounding jungles of the Riviera Maya. Whether you are looking for a quick trip through Mayan ruins or a full-day of things do do in Riviera Maya or you want to learn more about the history of the Mayan people, the ruins of el Rey are perfect for everyone. If you have ever wanted to explore one of the longest underwater cave systems in the world, then the best thing to do in Riviera Maya is to visit the incredible Sac Actun Cenote System. Situated in the jungle landscape that surrounds the city of Tulum, the Sac Actun Cenote System brings adventure to a new form of excitement. You will be amazed with the variety of activities you can combine with this stunning attraction which is often referred to as the Pet Cemetery because of the numerous animal fossils that have been found within the underground cave system. Options include a 4x4 jungle ride, snorkeling opportunities, journeys to the Mayan ruins of Tulum or Coba and adventure sports like rappelling as well as ziplining through the jungle canopy. The Sac Actun Cenote System offers something for everyone in the family and with the variety of ecosystems from beach to jungle to caves you will be pleased with your choice. 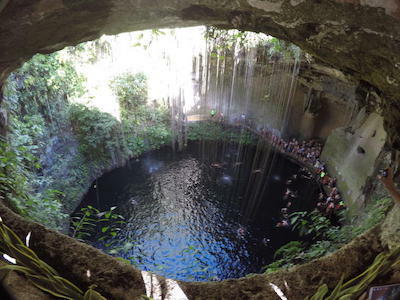 When you are seeking an intimate excursion into one of the more beautiful cenotes near Playa del Carmen, then the ideal thing to do in Riviera Maya is to book a tour to Cenote Chaak Tun. Located just north of Piste and Chichen Itza, Cenote Chaak Tun offers an incredible view into the world of Mayan culture and folklore. You will enjoy comprehensive narrative from a local guide that adds mystery, legends and sacred beliefs of the Mayans as you roam this small cenote. Filled with stalactites that gleam in your headlamp there is plenty to explore and you can even cool off in the underground waters. Your family will enjoy the options for excursions to Cenote Chaak Tun which can include stops at Chichen Itza as well as the beautiful city of Valladolid. 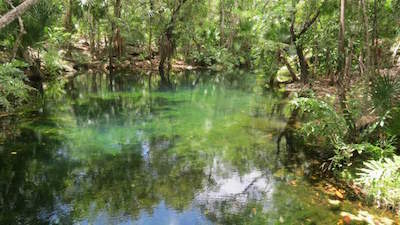 Whether you want a quick trip or a full-day tour of the area, a trip to Cenote Chaak Tun is ideal. 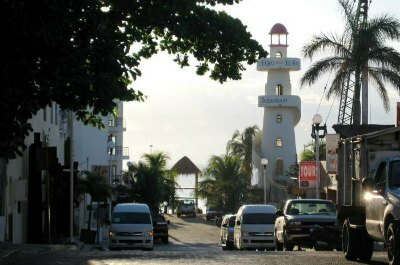 Organized tours to are available from hotels in Playa del Carmen in Riviera Maya. If you are searching for a cenote that mixes freshwater with saltwater and is ideal for a wide variety of activities, then the best thing to do in Riviera Maya is to visit the Casa Cenote. Located outside of Tulum, Casa Cenote is an adventure wonderland for explorers who like to visit as many ecosystems as possible in one day. Casa Cenote is a series of underwater sinkholes that combine to make for an excellent day of snorkeling, scuba diving, kayaking or just plain relaxing on the soft sand. You will enjoy plenty of sunlight here because the system is mostly open with a variety of interesting features from mangrove forests to underwater caves. 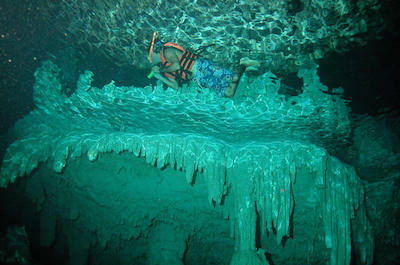 Casa Cenote is great for scuba divers because of the natural light that filters into the sinkholes you will explore. You will enjoy a variety of tours that include a variety of watersport things do do in Riviera Maya as well as adrenaline filled cliff jumping. Casa Cenote is the perfect half or full-day excursion for everyone. Organized tours to are available from hotels in Tulum and Playa del Carmen in Riviera Maya. If you and your family want to explore a series of cenotes all in one place, then the optimal thing to do in Riviera Maya is to book the Xenotes Oasis Maya tour. Located a short distance from Puerto Morelos and Playa del Carmen, Xenotes Oasis Maya is a series of four unique cenotes with each having a significant meaning in the Mayan culture. You will experience the Ka'ak cenote which represents fire is the perfect place to kayak or inner tube within a lush jungle landscape. The Lu'um cenote is the earth and contains numerous stalactites where you can rappel down to view as well as enter the crystal clear water. Water is the idea behind the Ha cenote and you can snorkel amidst exotic fish as well as learn about the important fauna of the Yucatan Peninsula. The fourth cenote Lik' represents wind and you plunge into the water after an exhilarating zipline trip. Xenotes Oasis Maya combines the best of all worlds of fun and learning about the Mayan Culture in a way that will leave you with lasting memories. 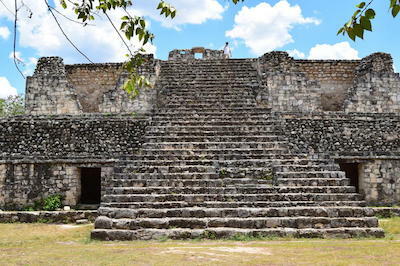 If you are seeking to view pristine Mayan ruins without all the crowds, then the ideal thing to do in Riviera Maya is to book a trip to Ek Balam. Located 100 miles away from the famed ruins of Chichen Itza, Ek Balam represents the remains of Mayan city that dates back to 1,200 B.C. You will be amazed at the condition of Ek Balam with the many structures that have been well preserved. There are a variety of large monster like sculptures at the entrance and you can even climb to the top of the Acropolis which towers some 100-feet above. You will view incredible artwork that includes the Black Jaguar which when translated means Ek Balam in Mayan. You can include Ek Balam as a side stop while touring Chicen Itza, a daytrip all to itself or you can even include a cenote swim as well as a trip to watch the flamingos in Rio Lagartos Nature Preserve. When you are seeking to combine one of the worldÕs best biosphere reserves with unique Mayan ruins, then the perfect thing to do in Riviera Maya is to visit the Muyil Ruins. 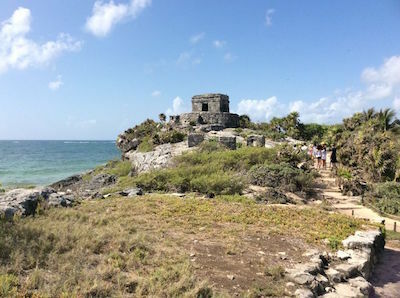 Located just south of Tulum, the Muyil ruins are a great start to learning the surrounding Mayan culture and the natural ecosystem of the Yucatan Peninsula. 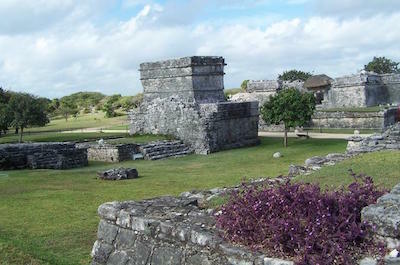 The Muyil ruins are small and significant which allow you to view an Mayan path called a sacbe as well as the well preserved stucco walls of the Pink Palace. You will be enthralled with the ruins as well as the numerous hiking trails that lead you into the UNESCO Sian KaÕan Bioshpere Reserve. You will like the variety of choices that include climbing an observation tower which offers big views of the jungle as well as a nearby lagoon where you can include a canoe or kayak trip. Another added bonus is that you can combine the smaller Muyil ruins with excursions to Coba, Chichen Itza and Tulum for a great day of Mayan history as well as culture. Organized tours to are available from hotels in Tulum and Playa del Carmen in Riviera Maya, and Cancun. When you want to completely emerged in one the world's best biosphere reserves, then a great thing to do in Riviera Maya is to explore the Sian Ka'an Biosphere Reserve. Located south of Tulum near the town of Felipe Carrillo Puerto, the Sian Ka'an Biosphere Reserve is a UNESCO World Heritage Site that encompasses 1.3 million-acres of natural beauty. You will be thrilled with the variety of excursions that will lead you into this jungle landscape that is situated along the coastline of the Caribbean Sea. The Sian Ka'an Biosphere Reserve is ideal for viewing the wildlife where you can watch fascinating animals such as crocodiles, ocelots, howler monkeys, flamingos, pumas and spider monkeys in their own natural habitat. You can spend a whole day exploring the biosphere reserve or combine this cool thing to do in Riviera Maya with a trip to the ruins at Coba or Tulum as well as a stunning cenote swim at Dos Ojos cenote. No matter whether you want hike or kayak or simply bird watch there is a perfect Sian Ka'an Biosphere Reserve excursion for you and your family. When you are seeking the perfect night of partying like a star, then the best thing to do in Riviera Maya is to spend an exhilarating evening at CoCo Bongo. You will be thoroughly pleased with the entertainment venue that includes stunning acrobatic performances flying through the air, incredible music that is accompanied by live musicians playing drums and bongos as well as all the dancing you can include in one evening. Excursions to CoCo Bongo include fantastic VIP no-waiting in line passes, open bar options and just plain admission tickets. 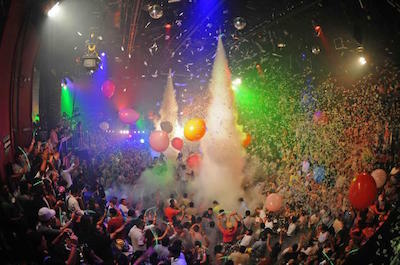 No matter how you decide to attend CoCo Bongo the music will thump your heart and the sounds of life will vibrate through the venue with laser lights, confetti as well as numerous high profile impersonators from Michael Jackson to Elvis to Rihanna. If you have ever dreamed of being in the middle of the jungle with hundreds of native animal species, then one of the best things to do in Riviera Maya is to visit the Punta Laguna Nature Reserve. Located near Nuevo Durango and the Mayan ruins at Coba, the Punta Laguna Nature Reserve is situated on 5,000-hectares of lush tropical jungle. You will thoroughly be pleased with the native wildlife you will view that includes Yucatan Peninsula animals that range from howler and spider monkeys to pumas to white-tailed deer to crocodiles as well as several hundred species of birds. There are a wide variety of tours to Punta Laguna Nature Reserve that can accommodate couples, families and singles. An another added bonus is that you can include stops at such stellar places as the Mayan ruins at Tulum or Coba, a kayak ride on the lagoon or an adrenaline filled zipline trip through the jungle - some of the most adventurous things to do in Riviera Maya! If you are a certified open water scuba diver and want the diving adventure of your life, then the only thing to do in Riviera Maya is to experience Cenote Dos Ojos. Located 4 miles north of Tulum and 30-minutes south of Playa del Carmen, Cenotes Dos Ojos are absolutely astonishing and remains in the worldÕs top ten for one of the longest underwater cave systems. Cenotes Dos Ojos is remarkable with explored length of 200-miles of explored area that includes spectacular stalactites and stalagmites all throughout the system which has 28 sinkhole entrances. You can experience an once-in-a-lifetime dive that is secured with a gold guideline throughout the 51-mile guided area of the cave system. 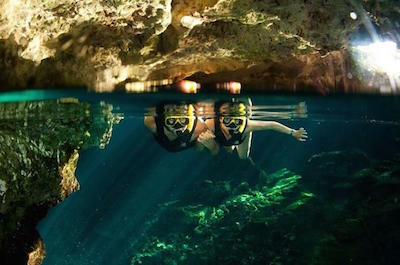 Families can enjoy snorkeling without entering the extreme underwater cave system. An added bonus with Cenote Dos Ojos is that this attraction can be included to other spectacular sites like the Mayan ruins at Coba, Tulum or a tour of the Sian KaÕan Nature Preserve. Organized tours to are available from hotels in Tulum, Playa del Carmen in Riviera Maya, and Cancun. If you are searching for a unique underwater adventure that involves either cave diving or snorkeling in a cave, then the best thing to do in Riviera Maya is to go to Grand Cenote. Located on the road to Coba just a short distance from Tulum, the Grand Cenote is an excellent adventure for families who snorkel together as well as experienced cave divers. As you wander through the underwater world of the Grand Cenote you will be amazed at the size of the stalagmites and stalactites that are throughout the water filled cave. Experienced cave divers can enjoy a 40-minute dive along a permanent gold guideline with an expert guide. An added bonus associated with the Grand Cenote is that you can combine this incredible journey with a trip to the ruins in Tulum, Coba or an adrenaline filled ATV ride at Native Park. One of the most memorable things to do in Riviera Maya for families and animal enthusiasts is to go swimming with dolphins at Delphinus Xcaret. Located 10-minutes south of Playa del Carmen and adjacent to Xcaret Eco Park, Delphinus Xcaret is situated on over 100,000 square feet of natural habitat. When you visit Delphinus Xcaret you will have the opportunity to choose from a variety of packages that offer value and sufficient time with these magnificent animals in their own natural environment. Excursions include a private ride, group swim, a splash around, a family experience and an exclusive program for couples. 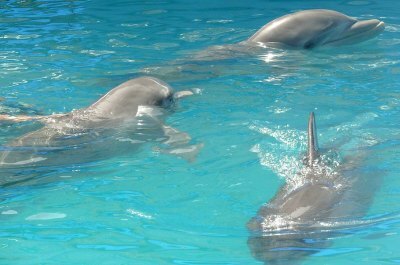 Each program lasts between 30 to 45-minutes and includes an educational program that explains the ecosystem that dolphins live and thrive within. Delphinus Xcaret is a great way to spend the day or combine this exciting attraction with a trip to the incredible Xcaret Eco Park. 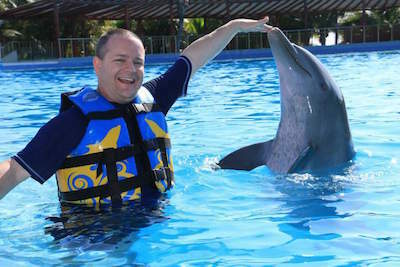 One of the more popular things to do in Riviera Maya for families is to take a trip to Dolphin Discovery. Dolphin Discovery offers a wide variety of locations from Puerto Adventuras to Cancun to Playa Del Carmen to Tulum. Dolphin Discovery has a program that will fit anyone's time frame and budget for swimming with dolphins. Each location has is constructed with a specialty design that allows the dolphins to live in a natural habitat such as lagoons or a protected cove with plenty of space to swim. You can choose from a simple Dolphin encounter where you stand in knee deep water and pet these magnificent animals. The swim Adventure Plus allows for you to engage with the dolphins by actually being towed while holding on to the dorsal fin and the Royal Swim Plus allows for more interactive time as well as a thrilling ride while standing on the dolphins powerful nose. Other added thing to do in Riviera Maya are the educational programs that explain the marine ecosystem in which dolphins live within. Dolphin Discovery is perfect for all families members and will leave lasting memories for all. 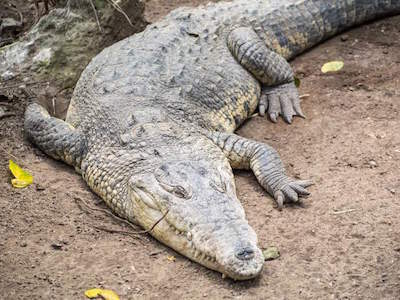 If you want an interactive activity that allows for up close viewing of the many animals that are native to the Yucatan Peninsula, then the best thing to do in Riviera Maya is to take the family to the Croco Cun Zoo. Located in Puerto Morelos between Cancun and Playa Del Carmen, the Croco Cun Zoo is a fun experience for anyone looking to increase their knowledge of the jungle ecosystem. Some visitors will refer to the Croco Cun Zoo as a petting zoo but this 60 to 75-minute is much more intense and offers educational exhibits as well as informative narratives from your personal guide. 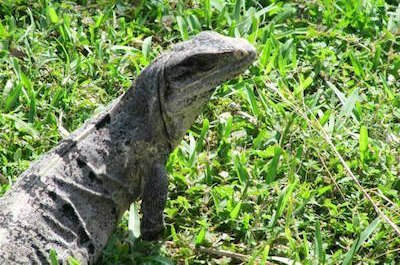 As you walk the grounds of the Croco Cun Zoo you will view exotic animals such as crocodiles, spider monkeys, snakes as well as numerous birds. When you need a pickup in your adrenaline you can stand two feet away from a crocodile in its own natural setting. If you get hungry there is a snack bar onsite. The Croco Cun Zoo is an ideal thing to do in Riviera Maya for families with kids of all ages. If you are looking to spend some time shopping and dining just moments away from the stellar beaches of Playa del Carmen, then the best thing to do in Riviera Maya for you is to walk down La Quinta Avenida. Located two blocks from the beach in Playa Del Carmen, La Quinta Avenida will amaze you in the diversity of shopping venues that range from H&M to Nike to Victoria Secret to Tommy Hilfiger. You will plenty of opportunities to browse unique souvenirs, silver from Taxco as well as art from local artists. Dining is fantastic with hundreds of choices from Italian cuisine at Di Vino to grilled delights at Sur Steakhouse to seafood at the Blue Lobster. Whether you want tacos, coffee at Starbucks or even Haagen Dazs there is a perfect place to relax while you are strolling down La Quinta Avenida. Sundown brings a different attitude with several choices for live music and if you like dancing then your starting point is La Quinta Avenida while you find the perfect things to do in Riviera Maya. When you are searching for that perfect thing to do in Riviera Maya for your family, then a trip to Cenote Chikin Ha is an ideal choice. 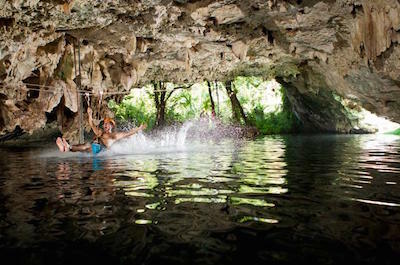 Located 14-miles south of Playa del Carmen, Cenote Chikin Ha has three exciting components that include Chikin Ha, TaÕak Bil-Ha and XÕtabay which is part of the larger Ponderosa underground river system that runs for almost 10-miles. Chikin Ha is an excellent cenote for snorkeling as well as scuba divers with two entrances and the water ranges in depth from 6 to 45-feet in depth. XÕtabay is perfect for experienced cave divers who are looking for exploration and TaÕak Bil-Ha is a series of collapsed caves which were used for Mayan ceremonies. Other activities available at Chikin Ha are watching ancient Mayan cleansing ceremonies as well as biking through the jungle and you can even soar on a zipline where you will land in a stunning cenote. The Akumal Monkey Sanctuary and Rescue Animals is one of the trendiest things to do in Riviera Maya for families that are interested in animals from around the world. The Akumal Monkey Sanctuary and Rescue Animals is a fascinating place that not only has animals from the Riviera Maya and Yucatan peninsula but also from species that have been left behind by zoos, circuses as well as people. 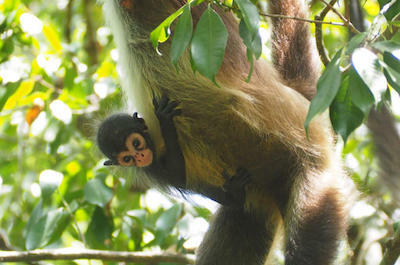 There are a variety of walking tours that include an excursion of the grounds where you can view animals such as spider monkeys, goats, kangaroos, ring-tailed lemurs and capuchin monkeys. You will enjoy educational programs as you stroll through the grounds and there is even an option to ride an ATV around the whole Akumal Monkey Sanctuary and Animal Rescue. If you are searching for a less traveled eco-park that is full of adventure, then one of the best things to do in Riviera Maya is to visit Ecopark Kantun Chi. Located 56-miles from Cancun and only 14-miles from Playa del Carmen, Ecopark Kantun Chi is situated in a pristine environment that is only minutes away from the Barcelo Maya Hotel. You will experience three distinct areas within Ecopark Kantun Chi which include cenotes, grottos and native plants as well as animals of the Riviera Maya. The cenotes offer incredible swimming opportunities in crystal clear water and the grottos are a spectacular display of passageways filled with stalactites as well as stalagmites. The area within Ecopark Kantun Chi is loaded with beautiful fauna that includes flowers to rare mushrooms and the animals range from spider monkeys to raccoons to white tail deer. There are things to do in Riviera Maya for everyone at Ecopark Kantun Chi that will leave lasting memories for years to come. 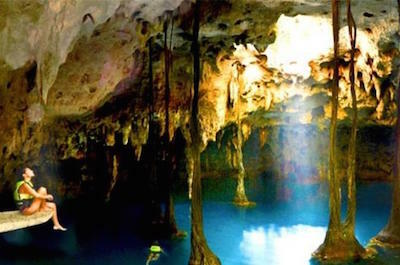 One of the more interesting things to do in Riviera Maya for small groups is to visit the LabnaHa Cenotes and Eco Park. Located 30-minutes south of Playa Del Carmen and 10-minutes north of Tulum, the LabnaHa Cenotes and Eco Park is also known as the Magic Mayan World and offers a wide variety of activities that will leave you breathless. When you arrive at LabnaHa Cenote and Eco Park you will be thrilled with the natural jungle setting that highlights the ecosystem of the Yucatan Peninsula. Experienced cave divers will enjoy the extensive underground river system while diving and snorkelers will adore the intricate stalactites as well as stalagmites within the LabnaHa Cenote. 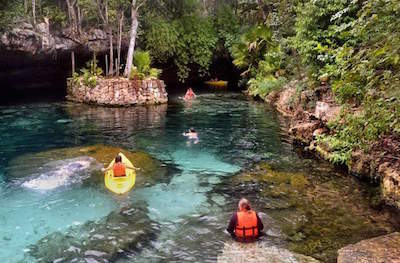 Other exciting thing to do in Riviera Maya have you flying on a zipline over the jungle into Sagrado Cenote or just swimming in the Magic Cenote and you can kayak in a mangrove forest. Another bonus about the LabnaHa Cenote and Eco Park is the valuable information you will learn about the natural ecosystem of the Riviera Maya. When you are seeking an eco-adventure that includes incredible rivers, cenotes and white sandy beach, then the best thing to do in Riviera Maya is to take the family to Tres Rios Ecopark. 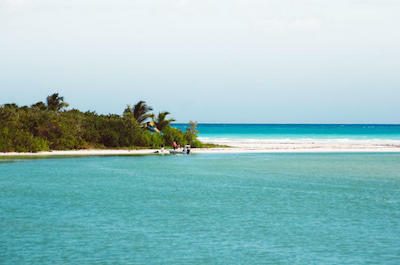 Located 35-minutes south of Cancun on your way to Playa Del Carmen, Tres Rios Ecopark is situated on over 326-acres of jungle and white sand beach landscape. You will enjoy a wide variety of water activities on the rivers from kayaking to canoeing to jet skiing through mangroves. You will be amazed at the snorkeling off the white sand shoreline and you can even a horseback or bike ride at Tres Rios Ecopark. 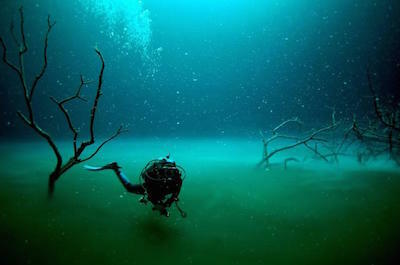 There are over 120 species of plants, 130 different animals and there are ten individual cenotes. Tres Rios Ecopark is the only natural park that includes three ecosystems which are the jungle, mangrove forest and white sand coastal dunes. An added bonus is the buffet lunch that is included in admission. Whether you want to relax on the beach and snorkel or explore the crystal clear rivers, Tres Rios Ecopark is a cool thing to do in Riviera Maya for a family. If you are seeking an adventure that includes visiting a traditional Mayan village with extra adrenaline filled activities, then a great thing to do in Riviera Maya is for you to visit TankKah Park. Located just minutes from Tulum, Tankah Park is an excellent representation of traditional Mayan culture mixed with a cenote for swimming and canoeing as well as an exciting zipline. At Tankah Park, you will view a traditional Mayan village complete with wooden-framed houses and original white paths named sac-be. You will be amazed at the flavorful food that is prepared and when you are ready for adventure you can enjoy a swim in the cenote. Another added bonus is the zipline attraction which drops you into the water of a lagoon after soaring over the jungle and for a more relaxing time you can try canoeing in the lagoon. This is a great family experience that involves culture, adventure and great food. If you want to relax, look at some beautiful sculptures and watch a traditional Mayan pole climbing ritual then Parque Los Fundadores is a great thing to do in Riviera Maya. Located in Playa del Carmen between the Caribbean Sea and La Quinta Avenida, the Parque Los Fundadores or Founding Fathers Park is situated just of Avenida Juarez. You have easy access to this park whether you are coming from Cozumel or arriving on the ADO bus from the airport. You can browse the nearby shops for souvenirs or even attend mass at Nuestra Senora del Carmen Church located in one corner of Parque Los Fundadores and the Portal Maya Statue is 52-feet high with exquisite detail. Children can release some energy at the pirate shaped playground apparatuses and you can nimble on fresh fruit. The Voladores de Papantla are spectacular and perform an ancient ritual from Veracruz with five individuals on ropes ascending as well as descending a 98-feet high pole to traditional music. One of the more interesting and highly acclaimed things to do in Riviera Maya is to view the amazing artwork at the 3D Museum of Wonders. Located in Playa del Carmen on Avenida 10 between Calle 8 and Calle 10, the 3D Museum of Wonders is the largest 3D museum in the world. You will be enthralled by the creations of Keith Wenner who started his career as a graphic artist and scientific illustrator for NASA. Mr. wenner would later study in Italy and form his own unique 3D Pavement Art. You will not believe the incredible pieces of works that seem to engulf your total surrounding in a surreal way that leaves you astounded. Mr. Wenner has transformed many of his asphalt and sidewalk designs and placed them on canvas as well as created more on a monthly basis. The 3D Museum of Wonders is a must see when you want to indulge your senses in something other than the Caribbean Sea and white sand beaches. The Galeria de Arte 5ta Avenida is a great thing to do in Riviera Maya when you want to view original art work from local artists throughout the Riviera Maya region. Located on La Quinta Avenida between Calle 6 and 8 in Playa Del Carmen, the Galeria de Arte 5ta Avenida is an upscale art gallery that sells unique pieces of art from paintings to sculptures. You will enjoy viewing artwork from local Mayan artists that bring the underworld mysticisms of the Mayan culture to canvass. You senses will be thrilled while you view pieces from regions such as Taino and Tzutujil. If you are a collector the Galeria de arte 5ta Avenida is fantastic since all the pieces on exhibit are for sale. The mixture of colors, scenery and culture that is exhibited in the artwork will please everyone and is a cool thing to do in Riviera Maya for entire family from young to old in age.